Holding up lighters at concerts dates back to medieval times, when villagers gathered with torches to frighten the loudest person in town. Face the music with this GrouponLive deal. When: Friday, October 11, at 7:30 p.m.
With more than 125 million records sold, more than 2,700 concerts performed, and a million faces seen and rocked, Bon Jovi has carved out a New Jersey–size place in the rock pantheon. The band’s current trek into stadiums and arenas around the globe solidifies its status as the world’s most pleasing natural phenomenon after pizza volcanoes. 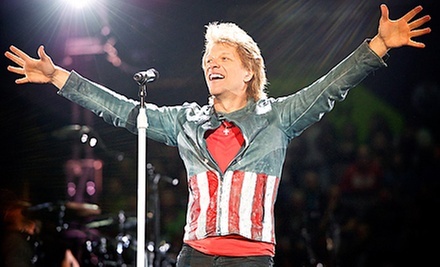 Bona-fide Bon Jovi fans can hope to hear songs from the band’s most recent chart-topping album, What About Now, along with classic smash hits such as “Livin’ on a Prayer,” “You Give Love a Bad Name,” and “It’s My Life.” Remind the city that it was built upon subterranean deposits of liquid rock ‘n’ roll with a night of rollicking, riffing, and sentimental sing-alongs.